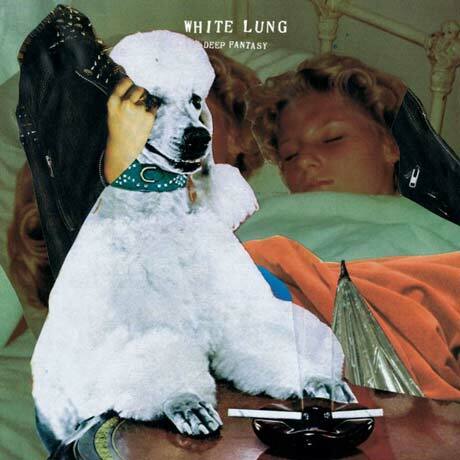 White Lung emerged from Vancouver's DIY underground fully formed. Fierce, abrasive, but with an inherent tunefulness, each of their records has expanded the band's sound without losing the blitzkrieg of rage that's always been at their core. Deep Fantasy, the band's third full-length, is the culmination of that expansion, just in time for the group's jump up to mega-indie Domino Records. Like their two previous efforts Deep Fantasy clocks in around 20 minutes, but it feels like a towering inferno next to those records. Founding bass player Grady Mackintosh was booted from the band last fall, leaving guitarist Kenneth William to fill out the bottom end. Both on bass and through reigning in his manic guitar playing, William builds a massive wall of sound, blown into overdrive by long-time producer Jesse Gander. It's the perfect instrumental foundation for singer Mish Way. With her vocals higher up in the mix than ever before, Way belts out her screeds tackling issues like substance abuse and body dysmorphia through her own unique and personal lens. For a band who have defined themselves by their take-no-prisoners approach, White Lung's newfound maximalist scope delivers without losing the idiosyncrasies that endeared fans to the band in the first place. Boasting a bigger sound with better songwriting, Deep Fantasy pulls no punches, yet still emerges as White Lung's boldest and most accessible album to date.